Francis Birch was a geophysicist, who participated in the Manhattan Project. He helped develop the Birch-Murnaghan equation of state and also researched compressional wave velocities. August 22, 1903Birth, Washington, DC. 1924Obtained SB in Electrical Engineering, Harvard University, Cambridge (Mass.). 1924 – 1926Engineer, New York Telephone Company. 1926 – 1928Studied at the University of Strasbourg under Pierre Weiss, no degree earned, Strasbourg (France). 1929Obtained AM, Harvard University, Cambridge (Mass.). 1932Obtained PhD in Physics, Harvard University, Cambridge (Mass.). 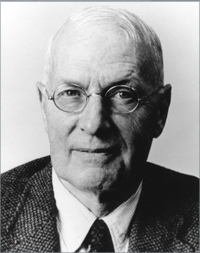 1932 – 1992Research Associate in Geophysics (1932-1943); Associate Professor of Geology (1943-1946); Professor of Geology (1946-1949); Sturgis Hooper Professor of Geology (1949-1974); and Sturgis Hooper Emeritus Professor of Geology (1974-1992), Harvard University, Cambridge (Mass.). 1942 – 1943Staff Member, Massachusetts Institute of Technology (MIT) Radiation Laboratory. 1943Officer, Bureau of Ships, United States Navy. 1943 – 1945Researcher, Manhattan Project (1943-1944) and Leader, Gun Group, Manhattan Project (1944-1945), Los Alamos Laboratory, Los Alamos (N.M.). 1945Little Boy Assembly Team Leader, Manhattan Project, Tinian Island. 1950Member, National Academy of Sciences. 1953 – 1954Chair, Division of Earth Sciences, National Research Council. 1964President, Geological Society of America. January 30, 1992Death, Cambridge (Mass.). Advisor at Harvard University and both employed at Harvard University. Both employed at Los Alamos Laboratory, Manhattan Project and Project Alberta, Manhattan Project. Both employed on Project Alberta, the Manhattan Project. Both employed on Project Alberta, Manhattan Project. Both employed at Los Alamos Laboratory and on Project Alberta, the Manhattan Project. Research Associate in Geophysics; Associate Professor of Geology; Professor of Geology; Sturgis Hooper Professor of Geology; and Sturgis Hooper Emeritus Professor of Geology. Obtained SB (Electrical Engineering) in 1924. Researcher and Leader, Gun Group, Manhattan Project. Researcher (Los Alamos Laboratory); Leader, Gun Group (Los Alamos Laboratory); and Little Boy Assembly Team Leader (Tinian Island). Obtained AM in 1929, PhD (Physics) in 1932. Chair, Division of Earth Sciences. Studied under Pierre Weiss (1926-1928), no degree earned. The nature of the solid earth : papers presented at a symposium held at Harvard University, Cambridge, 16-18 April, 1970 / Editor, Eugene C. Robertson ; Associate editors, James F. Hays and Leon Knopoff. Oral history interview with Gordon J. MacDonald, 1993 November 15, 1994 March 18 and 1995 August 4. Oral history interview with John and Betty Ewing, 1996-1997. Oral history interview with Robert Phillip Sharp, 1990 April 26. Oral history interview with S. Keith Runcorn, 1993 September 16 and 17. Sir Harold Jeffreys papers, 1886-1999. Handbook of physical constants / edited by Francis Birch, J.F. Schairer, and H. cecil Spicer. Francis Birch Physics Today obituary.